Posttraumatic Stress Disorder (PTSD) is presented as a dissociative identity clinical picture, accompanied by emotional disturbances such as depression, anxiety and apathy that lead to quality of life deterioration. Likewise, PTSD affects cognitive domains such as information processing (attention), evocation, consolidation and storage (memory), inability of individuals to plan, organize and direct their immediate behavior (executive functions), visual spatial, visual constructive and sensorial integration skills alterations have also been found. It was found that the prefrontal cortex, cingulate gyrus, limbic system, amygdala often have volumetric decrease in each of their structures, generating clinical symptoms of posttraumatic alexithymia, where the subject is unable to adequately respond to environmental stimuli, has problems in working memory, episodic memory and flash backs states that only accentuate behavioral problems presented in subjects with a diagnosis of PTSD. It is important that new lines of research focus on functional aspects of Neurorehabilitation, with the aim of improving the quality of life for the subjects, and thus preventing PTSD from becoming a mental health problem. At the end of the review there is an integrative proposal that aims to improve social, individual and familiar aspects of people with PTSD. Amygdala, prefrontal cortex, Hippocampus, Limbic system, PTSD. Forced displacement, armed conflict, physical and psychological abuse are variables related to posttraumatic stress disorder (PTSD) that tend to generate psychogenic disorders which, in turn, are related in people’s time and space, generating neurobehavioral disorders and emotional disorders that affect the subjects’ cognitive functioning and self-rated health [1-12]. Throughout human development different critical situations arise  which condition the body to a physical and psychological adaptability, however, over time other kind of situations occur that manage to destabilize the subject’s social, individual and family areas, especially those that inhibit the free development of the personality and that are accompanied by a dissociative disorder that affects the subjects’ handling of immediate situations . These situations, characterized by a state of physical and psychological distress, called PTSD, are within the category of anxiety disorders and are characterized by the presence of symptoms such as depression, anxiety and apathy by exposure to a traumatic event that include death, threats to the physical, social, family and mental integrity of the subject . Intrusive thoughts or memories of the traumatic event are also common, which may be associated with certain disorders, or where possible to entorhinal cortex and parahippocampal gyrus lesions, related to recall and storage of information processes [1,5,9,13-25]. Another characteristic symptom of subjects with PTSD is posttraumatic alexithymia, the inability of the individual to respond assertively to different stimuli or situations that arise in their immediate context. The data obtained from different sources [5,9,13-16,18,20] indicate that subjects with PTSD will present dysfunction in the right hippocampus, generating inability to discriminate different situations or stimuli. A dopamine overstimulation was also found [1,9,14,18] causing a series of inappropriate and disinhibited behaviors in the context where the subject operates . Other studies [5,8,9,13,16,15,18,21-27] have revealed that the prefrontal cortex and amygdala are susceptible areas in PTSD. They have a negative impact on planning tasks and emotional responses respectively. This article aims to identify the neuropsychological disorders in PTSD and the brain areas that are involved in this Neurobehavioral disorder. A Functional Neurorehabilitation proposal is presented with the aim of improving the quality of life in individuals with this diagnosis [28-41]. 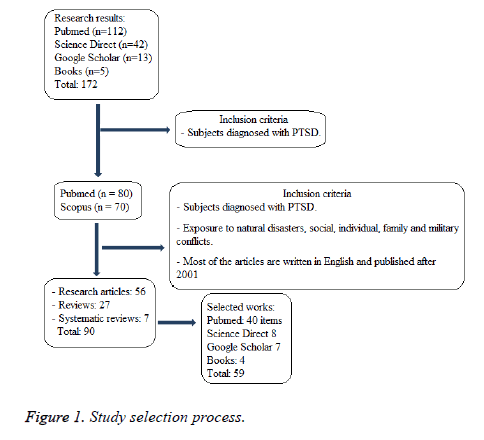 For the preparation of this review 59 primary references have been used, 30 research articles aimed at studying the neuropsychological disorders in victims of armed conflict, diagnosed with PTSD, 20 review articles, 4 meta-analysis studies and five book chapters. The search for information was made in PubMed, Google Scholar Sciencedirect and data. The initial search was performed using keywords (Posttraumatic stress disorder, PTSD, neuropsychological, executive functioning) obtaining a total of 172 references. Summaries of these studies were analyzed and 130 were selected. Later, those documents that met the criteria outlined in Figure 1, for an overall total of 59, were selected (Figure 1). Figure 1. Study selection process. The brain in the human organism has been developed to modify itself according to conservation needs . The increase in brain size is a sign of a kind of animal designed to transform itself structurally . Through the life cycle many changes occur as a result of the experience in terms of adaptation to different environments, this is called brain plasticity  in other words, personality fits the immediate context of the subject, thereby seeking to diversify their behavior in the face of stimuli that the individual receives daily. Brain changes that come from experience cause changes at a cognitive level and/or on the behavior, emotional appearance, personality or more specific aspects that relate to the functions performed by the affected brain areas . The experiences that come from the interaction with the environment, cause in the human body brain changes that manifest themselves in response, behavior or behavior patterns in the body; some specific experiences can produce in the subjects positive effects that help the adaptation of the individual, these relate to changes in brain structure [46-50], as in a healthy state [51-53], further development in cognitive functioning [54,55], increased brain plasticity and subject's ability to modify their behavior in terms of adaptation . However, just as we find experiences that when applied on a subject produce brain changes that are considered as structural improvements, there are also others that cause structural damage and dysfunction in brain networks and that are distributed in the space of neural networking, cortical and in a diencephalic manner , these experiences lead to inadequate coping responses such as fear or social isolation  and these responses are known as maladaptive for the negative effects that these bring to the adaptation of the subjects to later environments or behaviors. In subjects with PTSD several brain changes that generated maladaptive reactions were found. Different studies, [3-5,21-22,30-31,57-59] show that exposure to a traumatic experience leads the body to making changes in the brain structure. The deficits that are observed in subjects with a PTSD diagnosis are manifestations of neurological character . In PTSD these neuropsychological alterations caused by adverse experience lead to a great emotional, physical and social deterioration and, as a result, the patient´s lifestyle, behavior and behavioral expression are modified in particular and/or different ways. The characteristics of the neuropsychological disorders are linked to the manifestations of the traumatic event, which affect some factors such as the intensity of the disorder or its prevalence . With a greater dissociative degree observed in patients with PTSD a higher intensity of the traumatic event source and greater chronicity of the disease are deduced [5,10], the lower the age of the subject exposed to the traumatic experience, the greater the risk of presenting PTSD and the symptoms will be more severe [24,59] even, it was found that patients with a history of child abuse show a decrease in the dorsolateral (DLC) and orbitofrontal (OFC) cortex, the alteration in the DLC is related to a deficit in some cognitive functions related to working memory, processing stimuli such as attention, reasoning and conceptualization, while alteration of the OFC is related to low emotional regulation and greater propensity to aggressive behavior . PTSD is related to a greater proportion with females who are twice more likely to develop this disorder than males , it also affects people who are single, divorced, widowed or that are in a situation of forced separation . Similarly, some patients who already had other serious psychiatric disorders such as bipolar disorder and that present comorbidity with PTSD reported some alterations that are related to a poorer quality of life and less chance of recovery, as well as a high rate of attempted suicide [55,58-59], taking into account that between 50% and 90% of the cases of PTSD patients have a secondary disorder associated to affective disorders such as mixed anxiety and depression. It is necessary to note that most clinical cases with PTSD will not recover unless the comorbid disorder is treated or overlapped with other clinical entities . The physical deterioration of the patients is related to the overexcitement of corticosteroids in the brain, creating medical conditions such as atherosclerosis, diabetes, osteoporosis, hypertension, peptic ulcer and obesity that are related to the deterioration of the quality of life and low cognitive functioning, which are associated with different emotional disorders that adversely affect the daily life activities of subjects with PTSD [10,57]. Some authors [10,57] found that exposure to high levels of stress leads the high concentrations of adrenal steroids to produce a suppressive effect of the immune system and the production or secretion of proinflammatory cytokines, which generate a clinical picture of psychosocial stress or generalized anxiety on the subjects. Anxiety as an emotional disturbance affects the hippocampalprefrontal cortex connection (PFC) [5,15] causing a negative impact on decision making, planning tasks and deteriorating the quality of life. Subjects who witnessed Hurricane Andrew, showed cytotoxicity in lymphocytes, cytotoxicity was similar to patients with autoimmune diseases such as rheumatoid arthritis, erythematosus systemic and sarcoid lupus, accompanied by anxiety and depression as common emotional disorders [5,16]. In patients with PTSD the emotional deterioration can be observed through the high rate of comorbidity with depressive disorder and suicidal ideation observed in these patients, a study on victims of armed conflict in northern Uganda "Factors associated with post-traumatic stress disorder and depression among internally displaced people in northern Uganda " involved a participant sample between 12 and 25 years of age, with the aim of evaluating symptoms of the PTSD diagnosis and depression, finding that the PTSD prevalence rates were of 25 % in subjects in the capacity as soldiers and 7% in control subjects, as well as a high suicide ideation present in subjects involved with war, and 6% in the population without this type of exposure . The authors conducted a study to measure PTSD and depression in the population of the city of Juba (Sudan), through surveys applied to the sample, they found that 36% of respondents met the PTSD symptomatology clinical criteria, where the rate of this disorder was 42.5% among women and 29.7% among men, likewise, 50% of the sample met diagnostic criteria for clinical depression (58% among women and 40.9% among men) . This reinforces the claim that emotional disorders such as depression and anxiety suggest a more systematic evaluation process in intervention to establish lines of action, in order to put the subject in an immediate social context where he can develop freely and under the social guidelines that society demands. Other alterations which impair the emotional stability and lifestyle of subjects exposed to trauma were found, among them is the tendency to present a dissociation reaction of their personalities, this is split, separating the daily survival functions from traumatic memories . In all PTSD dissociative reactions mentioned, a biological correlation was found, some research [6,10] show the structural changes caused by the best known PTSD dissociative reactions , some of these symptoms are described in DSM-IV  as recurrent, distressing, involuntary and intrusive memories, recurring dreams , re-experiencing the event, intense psychological discomfort, intense physiological reactions, effort to avoid thoughts, emotions or data relating to the event and dissociative symptoms , shown below. Dissociation symptoms present in PTSD, classified according to the shape of their symptoms, are observed in (1) Psychoform and (2) Somatoform dissociative disorders and, depending on their structure, in (1) Psychological and (2) Morphological dissociative disorders . Symptoms of psychoform dissociation are mainly memory impairments, perception of the environment, identity, emotional, cognitive or sensory disturbances , while the symptoms of somatoform dissociation found are body anesthesia, analgesia or intolerable pain , these are eventually accompanied by symptoms of dissociation such as perceptual distortion of time, space, reality and identity, cognitive symptoms such as confusion, dysplasia, dyscalculia, attention deficit, impaired memory and sleep states . In PTSD the PFC is directly affected , presenting alterations such as hypoactivation in the medial prefrontal region, specifically the anterior cingulate cortex (aCC), ventromedial prefrontal cortex (vmPFC), pericallosal sulcus and OFC which would cause an inability to attentional control and response to stimuli that are related to the PTSD traumatic event trigger . Dysregulation of the amygdala often cause adverse behavior to their immediate context, affecting their quality of life and cognitive functioning, some flashback states that subjects experiment with responses of fear, panic, and in several cases of violent behavior, attention problems and memory, are associated with poor inhibitory control of executive functions in response to the fear brought about by the alteration made in the region of the medial prefrontal cortex (mPFC) , this in turn affects the decision-making, motor planning tasks, working memory, learning and states of focused and selective attention [5,9,15]. The PFC fails to fulfill its function due to limbic decompensation , hypoactivity in the PFC and decreased blood flow in the medial parietal and occipital BFC [5,11,15,18,23,46] often leads to inability to learn new tasks and uninhibited behaviors. Cognitive and immediate information handling deficit is linked to working memory  and executive functions, which is increased by the tendency to amygdala over activation and locus coeruleus , processes that cause flashbacks, amnesia and dissociative states  leakage, the chronic state of emotional unrest caused by the constant nerve emergences lowers the levels of attention (targeted and selective) [8,13,15] planning [13,15], autobiographical memory and immediate verbal memory , increasing the appearance of some more specific cognitive deficits such as learning [5,9,13,27]. The alterations found in implicit memory, such as the procedural one, relate to the inability to carry out some automatic activities, this is due to amygdala hypersensitivity that affects some patients with PTSD , since the process carried out in the procedural memories deficit is related to panic reactions, the learning established in times of amygdala helplessness and limbic centers is activated and fired generating fear reactions and preventing the necessary attention to procedural tasks . One of the functions of the PFC is the evocation of information in working memory, which is affected by stress, as well as by other processes such as reaction to emotional stimuli and the development of cognitive tasks such as decision making, planning, organization and behavioral flexibility, these functions are altered, because the chronic stress is associated with a reduction of neuronal activation in the network that connects the PFC and the hippocampus [5,13]. This is related to increased over activation of corticosteroids . Data that are verified by different research on subjects with and without PTSD, show that there are both anatomical and physiological differences that affect memory, learning, emotional control, social and moral development [5,8-9,14,21-23,25-27,51,55]. It is necessary to note that there is no information processing in episodic memory  therefore, an important part of the semantic memory is not stored, preventing the use of valuable information for future behavior. The inability to perform declarative memory tasks, is even more specific , to the extent that there is an alteration by reduction of gray matter in the left insula, which produces a state of posttraumatic alexithymia or verbal difficulty to identify or even express emotional states related to trauma; in this case trauma is related to an impairment in declarative or semantic/explicit memory, its dysfunction is associated with abnormal functioning of the hippocampus , the PFC and cortical pathways, which is associated with other disorders such as hypermnesia, amnesia or memory distortion . Alterations in extinction memory appear as an alteration in the mPFC due to either hypoactivation or reduction of blood irrigation  to this area that allows the modification of previously conditioned responses , traumatic memories perform an intrusive function in PTSD and oblivion is one of the main problems of this disorder, these alterations in learning and in the inability to forget or stop recalling traumatic memories,  are related to the functioning of the mPFC, the brain region that controls the extinction of learned behaviors such as fear response at the memory or reminding element, in the process of extinction of the response are involved two subregions of the mPFC, the pre limbic (PL) and infra limbic (IL) subregions, the activation of the PL subregion favors failure maintaining fear responses; on the other hand the IL subregion, controls the reduction in the fear response and therefore strengthens the formation of extinction memory . Different studies have concluded that the mPFC is the brain region that controls the extinction of automatic fear response [10,47]. It was found that the amount of Pos protein in the PFC, in the IL and PL sections, was significantly increased in the group that managed to reduce the fear response . The intermediate extinction deficit is a lack of activation of the mPFC, for this reason functional Neurorehabilitation plans must be created in order to improve the poor inhibitory control, which is associated with the fear response promoted by the alteration presented in the mPFC region [9,15]. Figure 2 shows brain structures that are compromised by PTSD. Figure 2. Midsagittal cut at the height of the corpus callosum genu. Brain structures that are involved in PTSD own image. Lesions in the limbic system are widely mentioned in the research on PTSD, several authors argue that memory deficiencies relate to an alteration of this type [8,57,58] this is the result of a process that occurs during episodes of stress where the hypothalamic-pituitary-adrenal axis that causes an increased cortisol level is activated, which modulates normal physiological responses to stress, abnormally high levels of cortisol may also reduce the hippocampus-PFC neural connection affecting synaptic plasticity generating, among other symptoms, the visual spatial memory deficit [5,13,14]. A smaller hippocampus is related to dysfunctions in the use of allocentric visual spatial memory , likewise the increase of glucocorticoids in this structure also causes the decrease of dendritic divisions, modifications terminal synaptic structure and inhibition of neuronal regeneration which in turn is related to a deficit not only in memory but also in learning which is further diminished by the decrease in the information consolidation and recall processing [5,27,54]. Dissociative symptoms that affect memory in PTSD such as the alterations due to visual spatial memory deficit [5,9-21], posttraumatic alexithymia  and episodic memory deficit [5,21] are related to dysfunctions in the hippocampus, especially in the synaptic projections deficit and the inhibition of neurogenesis in specific parts of this structure, which has been previously linked with chronic stress. It was found that the episodic memory deficit relates specifically to the dentate gyrus, a part of the hippocampus that has dysregulation characteristics caused by PTSD . The alterations found in the explicit, semantic and episodic memory relate to each other  and are associated with the inability to remember and put into words the emotions or events experienced, there are alterations in the declaratory, autobiographical and verbal memory , a group of war veterans with PTSD showed symptoms of dissociation, related to limbic dysfunctions that are associated with alterations in the declaratory, autobiographical and verbal memory . Other authors [5,21,27] recognize the relationship between hippocampal hypertrophy and the limitations on the use of some memories, however, the deficits in episodic memory are related to the dentate gyrus, this is a hippocampal structure that presents a volumetric decrease in PTSD, and is inhibited in its neurogenesis and in the projection of its dendritic branches, thus causing problems in the subject in the neurobiological basis of memory . It has been found that during PTSD, episodic memory indefinitely stores information in the right limbic system in a dysfunctional way, causing vivid images of the traumatic experience, thoughts, feelings and intrusive sensations. The intrusion of such traumatic memories causes anxiety, maladaptive coping strategies, depression and anxiety that are associated with posttraumatic Alexitimia . Some research argue that there is a negative effect of chronic or prolonged stress on hippocampal volume [5,21,27,54], and although studies of neuroimaging in the brains of subjects with and without PTSD [15,52] show that the volume of the left hippocampus was smaller in patients with PTSD than those in the control group, associated with poor performance on visual spacial memory tests . In general, in a patient afflicted with this disorder, it is difficult to determine if there is or there is no a hypertrophic alteration in the hippocampal structure, and even this factor could have acted as a risk factor prior to PTSD . Another study  argues that there is neither direct nor necessary connection between hippocampal volume reduction and PTSD, however a relation between the decrease in hippocampal volume and steroids which are produced when exposed to high levels of stress was found, in the absence of an elevated cortisol increase in a patient, there should not be damage in the hippocampus , this may confirm the relationship between corticoids, more specifically glucocorticoids produced by prolonged or chronic stress and structure hypertrophy, decreasing neurogenesis, dendritic projections and hippocampal volume in specific areas of the hippocampal such as the dentate gyrus . This would explain why some researchers find no decrease in the hippocampus in patients with PTSD, the hippocampal brain dysfunction is related to the excessive production of corticosteroids from exposure to high levels of stress and chronic stress and not to other types of stress that may occur in patients with milder PTSD disorders, not all the subjects with PTSD have prolonged or chronic stress and, therefore, not all of them have the structural modification of an amygdala or a hypertrophic hippocampus [9,18], then, it is necessary to begin establishing diagnostic categories in patients with PTSD. Structural areas such as the hippocampus and the amygdala are often overactive [5,9-10,13,15,18,23,25,46] linked to emotional responses of tears, pain, aggression and bad information processing, and in the same way, an increased blood flow to the amygdala  affects learning and the consolidation of new tasks [15,46]. The locus coeruleus, located in the dorsal or posterior area of the brainstem is altered, the noradrenaline deficit do not give the subject the necessary capacity to adequately respond to stress situations, panic, [5,9,18,56] numbness and catatonia , this relates to an increase in heart rate, blood pressure and blood flow in the brain to the posterior structures of the brainstem, especially the locus coeruleus [10,46] also associated with dissociative disorders. Dissociative symptoms affecting the affective area are depression , panic attacks, numbness, catatonia  and generalized anxiety and emotional deterioration [7,9] and the emergence of maladaptive behaviors . The avoidance and depressive behaviors , characteristic symptoms of PTSD patients, are related to a modification of the regulation of the serotonergic system, while psychotic type reactions present in the same disorder, relate to the role assumed by the dopaminergic pathways . The clinical pictures of generalized anxiety disorder have an etiology related to trauma, and physiological responses that cause a narrowing of consciousness; this not only presents the dissociation of episodic memories but degrees of semantic and procedural dissociation are also observed. Affective and behavioral dissociation, are presented in somatoform symptoms and alterations in perception of self [29,46,52]. In PTSD, an increase in serum interleukin was found , causing sleep disturbances, eating disorders, psychomotor retardation, sexual dysfunction and recurrent episodes of fear . These recurrent episodes of fear and the failure of the PFC in modulating emotions or planning tasks have been explained as an affectation of the connection between brain structures due to the particular damage on some of them. In PTSD not only the structures but also the connections between the insula, hippocampus, cingulate gyrus, amygdala and PFC are affected , each of these areas is affected individually by different PTSD trauma factors and together they produce major dysfunctions in neurotransmission systems. There is a significant alteration related to the norepinephrine neurotransmitter systems , an alteration in the locus coeruleus, which has a hyperarousal, relating this with panic reactions and stress, another study shows , an important dysregulation in noradrenergic system (increase) leading to a high level of activity of the sympathetic nervous system, causing fear and excessive hyperarousal; as this noradrenergic system is related to memory, it may intensify trauma memories and make the subject remember them more easily, quickly and stormingly, for this reason, it is necessary to use Functional Neurorehabilitation techniques to improve the quality of life in subjects diagnosed with PTSD. 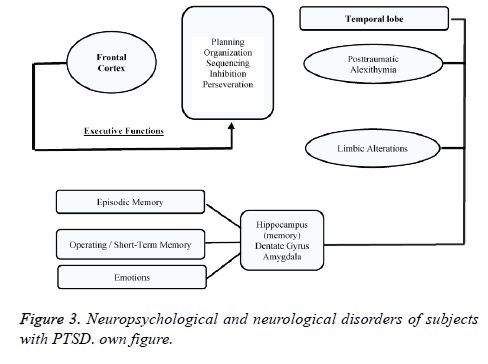 Figure 3 represents Neurological and Neuropsychological alterations subjects with PTSD are exposed to. Figure 3. Neuropsychological and neurological disorders of subjects with PTSD. own figure. Subjects with PTSD have trouble planning and organizing their immediate behavior, they are unable to make decisions, their behavior is often impulsive (executive functions), accompanied by inadequate responses to their context (posttraumatic alexithymia). Also, subjects with PTSD often have problems to evoke and consolidate information (memory), and present flashback states that continually deteriorate their quality of life. • Research on anxiety disorders, focusing on PTSD should take as intervention targets resilient groups, in order to show people diagnosed with PTSD strategies to improve their quality of life . • The clinical Neuropsychology evaluation process will allow to identify on time the cognitive domains that are affected by PTSD, and thus, will contribute to improving the quality of life and the slowing of clinical post-traumatic alexithymia. • Social reintegration of subjects with PTSD should include family aspects, with the aim of strengthening emotional, social and individual bonds, thus strengthening the reintegration of the subject to an individual context. • Emotional disturbances should be taken as a primary target for therapeutic intervention, with the aim that these (depression, anxiety and apathy) do not adversely affect cognitive performance (attention, memory, executive functions, visual spatial functioning, visual constructive skills) and, more directly, their quality of life. • Within the scope of PTSD Neurorehabilitation, and based on the brain's ability to be modified through experience, some behaviors or experiences that have been linked to the improvement of specific cognitive abilities affected by the disorder, such as brain plasticity and adaptability, must be taken into account. This can be tied to a continuous education process in subjects diagnosed with PTSD. • Finally, Functional Neurorehabilitation techniques focused on the disruption of their cognitive domains will generate an improvement in their quality of life and slowing down of clinical pictures of a neuropsychiatric nature. Final note: War in its etymological dimension should not always be related to weapons. To have a stable and lasting peace, it is urgent to intervene the social sectors (social and excluding war) and dimensions that rightfully correspond to man, in this case, quality education, health par excellence, decent work and less ignorant politicians who in the midst of their supposed wisdom, only want to improve their own quality of life while degrading that one of those who really are the essence of a nation, the people, in this case, the ordinary citizen, the Colombian. Auxemery Y. Posttraumatic stress disorder (PTSD) as a consequence of the interaction between an individual genetic susceptibility, a traumatogenic event and a social context. Encephale 2012; 38: 373-380. Charlson FJ, Steel Z, Degenhardt L, Chey T, Silove D, Marnane C. Predicting the impact of the 2011 conflict in Libya on population mental health: PTSD and depression prevalence and mental health service requirements. PLoS One 2012; 7: e40593. Ertl V, Pfeiffer A, Schauer-Kaiser E, Elbert T, Neuner F. The challenge of living on: psychopathology and its mediating influence on the readjustment of former child soldiers. PLoS One 2014; 9: e102786. Hewitt N, Gantiva C, Vera A, Cuervo M, Hernández N. Afectaciones psicológicas de niños y adolescentes expuestos al conflicto armado en una zona rural de Colombia. Acta Colombiana de Psicología 2014; 17: 79-89. Hurtado González CA. Alteraciones neuropsicológicas en el estrés postraumático. 2011. Reinders AA, Nijenhuis ER, Paans AM, Korf J, Willemsen AT. One brain, two selves. Neuroimage 2003; 20: 2119-2125. Roberts B, Yona E, Lomoro O, Sondorp E. Post-conflict mental health needs: a cross- sectional survey of trauma, depression and associated factors in Juba, Southern Sudan. 2009; doi: 10.1186/1471-244X-9-7. Roca V, Hart J, Kimbrell T, Freeman T. Cognitive function and dissociative disorder status among veteran subjects with chronic posttraumatic stress disorder: a preliminary study. J Neuropsychiatry Clin Neurosci 2006; 18: 226-230. Scaer RC. The neurophysiology of dissociation and chronic disease. Appl Psychophysiol Biofeedback 2001; 26: 73-91.
van der Hart O, Nijenhuis E, Steele K, Brown D. Trauma-related dissociation: conceptual clarity lost and found. Aust N Z J Psychiatry 2004; 38: 906-914. American Psychiatric Association, American Psychiatric Association. Diagnostic and statistical manual of mental disorders (DSM). Washington, DC: American psychiatric association 1994: 143-147. Admon R, Milad MR, Hendler T. A causal model of post-traumatic stress disorder: disentangling predisposed from acquired neural abnormalities. Trends Cogn Sci (Regul Ed ) 2013; 17: 337-347. Cerqueira JJ, Mailliet F, Almeida OF, Jay TM, Sousa N. The prefrontal cortex as a key target of the maladaptive response to stress. J Neurosci 2007; 27: 2781-2787. Solomon EP, Heide KM. The biology of trauma: implications for treatment. J Interpers Violence 2005; 20: 51-60. Patel R, Spreng RN, Shin LM, Girard TA. Neurocircuitry models of posttraumatic stress disorder and beyond: a meta-analysis of functional neuroimaging studies. Neurosci Biobehav Rev 2012; 36: 2130-2142. Shaw RJ, Bernard RS, Deblois T, Ikuta LM, Ginzburg K. The relationship between acute stress disorder and posttraumatic stress disorder in the neonatal intensive care unit. Psychosomatics 2009; 50: 131-137. Simmons AN, Matthews SC. Neural circuitry of PTSD with or without mild traumatic brain injury: a meta-analysis. Neuropharmacology 2012; 62: 598-606. Taylor S, Asmundson GJ. Posttraumatic stress disorder: Current concepts and controversies. Psychol Injury Law 2008; 1: 59-74. Van der Hart O, Steele K, Nijenhuis E, Assen H. El Tratamiento de los Recuerdos Traumáticos en Pacientes con Trastornos Disociativos Complejos. Parte uno de dos. Werner NS, Meindl T, Engel RR, Rosner R, Riedel M, Reiser M. Hippocampal function during associative learning in patients with posttraumatic stress disorder. J Psychiatr Res 2009; 43: 309-318. Bressan RA, Quarantini LC, Andreoli SB, Araújo C, Breen G, Guindalini C. The posttraumatic stress disorder project in Brazil: neuropsychological, structural and molecular neuroimaging studies in victims of urban violence. BMC Psychiatry 2009; 9: 1. Stoppel C, Heinze H. Structural alterations in lateral prefrontal, parietal and posterior midline regions of men with chronic posttraumatic stress disorder. J Psychiatry Neurosci: JPN 2011; 36: 176. Groblewski PA, Stafford JM. When the medial prefrontal cortex fails: implications for extinction and posttraumatic stress disorder treatment. J Neurosci 2010; 30: 7124-7126. Nijenhuis ER, Van der Hart O, Kruger K, Steele K. Disociación somatoforme, trauma y defensa. Aust N Z J Psychiatry 2004; 38: 678-686. Phelps EA. Emotion and cognition: insights from studies of the human amygdala. Annu Rev Psychol 2006; 57: 27-53. Panksepp J. Textbook of biological psychiatry, John Wiley & Sons, 2004. Shin LM, Rauch SL, Pitman RK. Amygdala, medial prefrontal cortex, and hippocampal function in PTSD. Ann N Y Acad Sci 2006; 1071: 67-79. Van Der Hart O, Nijenhuis E. Generalized dissociative amnesia: episodic, semantic and procedural memories lost and found. Aust N Z J Psychiatry 2001; 35: 589-600. Darwin C. El origen de las especies, estudio preliminar de Juan Comas, traducción de Antonio de Zulueta. UNAM, México (Nuestros Clásicos: 13) 2009. Soligo C, Smaers JB. Contextualising primate origins--an ecomorphological framework. J Anat 2016; 228: 608-629. Sweatt JD. Neural plasticity and behavior - sixty years of conceptual advances. J Neurochem 2016; 139 Suppl 2: 179-199. Damasio AR. Descartes' error revisited. J Hist Neurosci 2001; 10: 192-194. Hötting K, Röder B. Beneficial effects of physical exercise on neuroplasticity and cognition. Neurosci Biobehav Rev 2013; 37: 2243-2257. Lautenschlager NT, Cox KL, Flicker L, Foster JK, van Bockxmeer FM, Xiao J. Effect of physical activity on cognitive function in older adults at risk for Alzheimer disease: a randomized trial. JAMA 2008; 300: 1027-1037. Mustroph ML, Chen S, Desai SC, Cay EB, DeYoung EK, Rhodes JS. Aerobic exercise is the critical variable in an enriched environment that increases hippocampal neurogenesis and water maze learning in male C57BL/6J mice. Neuroscience 2012; 219: 62-71. Raichlen DA, Gordon AD. Relationship between exercise capacity and brain size in mammals. PloS one 2011; 6: e20601. Thomas AG, Dennis A, Bandettini PA, Johansen-Berg H. The effects of aerobic activity on brain structure. Front Psychol 2012; 3: 86. DeFina LF, Willis BL, Radford NB, Gao A, Leonard D, Haskell WL. The association between midlife cardiorespiratory fitness levels and later-life dementia: a cohort study. Ann Intern Med 2013; 158: 162-168. Erickson KI, Voss MW, Prakash RS, Basak C, Szabo A. Exercise training increases size of hippocampus and improves memory. Proc Natl Acad Sci U S A 2011; 108: 3017-3022. Buchman AS, Boyle PA, Yu L, Shah RC, Wilson RS, Bennett DA. Total daily physical activity and the risk of AD and cognitive decline in older adults. Neurology 2012; 78: 1323-1329. Weuve J, Kang JH, Manson JE, Breteler MM, Ware JH. Physical activity, including walking, and cognitive function in older women. JAMA 2004; 292: 1454-1461. Hagenaars MA, van Minnen A. Posttraumatic growth in exposure therapy for PTSD. J Trauma Stress 2010; 23: 504-508. Long Z, Duan X, Xie B, Du H, Li R, Xu Q. Altered brain structural connectivity in post-traumatic stress disorder: a diffusion tensor imaging tractography study. J Affect Disord 2013; 150: 798-806. Milad MR, Pitman RK, Ellis CB, Gold AL, Shin LM. Neurobiological basis of failure to recall extinction memory in posttraumatic stress disorder. Biol Psychiatry 2009; 66: 1075-1082. Ramaswamy S, Madabushi J, Hunziker J, Bhatia SC, Petty F. An Open-Label Trial of Memantine for Cognitive Impairment in Patients with Posttraumatic Stress Disorder. J Aging Res 2015; 2015: 934162. Roy MJ, Costanzo M, Gill J, Leaman S, Law W, Ndiongue R. Predictors of neurocognitive syndromes in combat veterans. Cureus 2015. Stammel N, Abbing EM, Heeke C, Knaevelsrud C. Applicability of the ICD-11 proposal for PTSD: a comparison of prevalence and comorbidity rates with the DSM-IV PTSD classification in two post-conflict samples. Eur J Psychotraumatol 2015; 6: 27070. Steel Z, Chey T, Silove D, Marnane C, Bryant RA, Van Ommeren M. Association of torture and other potentially traumatic events with mental health outcomes among populations exposed to mass conflict and displacement: a systematic review and meta-analysis. JAMA 2009; 302: 537-549. Van der Hart O, Nijenhuis ER, Solomon R. Dissociation of the personality in complex trauma-related disorders and EMDR: theoretical considerations. J EMDR Practice Res 2010; 4: 76-92. Boreu QF, Alonso MJÁ, Costa RC, Negre MC, Nebot FJA. Comorbilidad del trastorno por estrés postraumático en pacientes con trastorno mental grave. Implicaciones clínicas. Psiquiatría Biológica 2010; 17: 134-137. Quarantini LC, Miranda-Scippa Â, Nery-Fernandes F, Andrade-Nascimento M, Galvão-de-Almeida A, Guimarães JL. The impact of comorbid posttraumatic stress disorder on bipolar disorder patients. J Affect Disord 2010; 123: 71-76. Lensvelt-Mulders G, van Der Hart O, van Ochten JM, van Son MJ, Steele K, Breeman L. Relations among peritraumatic dissociation and posttraumatic stress: A meta-analysis. Clin Psychol Rev 2008; 28: 1138-1151. Brewin CR, Kleiner JS, Vasterling JJ, Field AP. Memory for emotionally neutral information in posttraumatic stress disorder: A meta-analytic investigation. J Abnorm Psychol 2007; 116: 448. Wang Z, Neylan TC, Mueller SG, Lenoci M, Truran D, Marmar CR. Magnetic resonance imaging of hippocampal subfields in posttraumatic stress disorder. Arch Gen Psychiatry 2010; 67: 296-303. Isaac CL, Cushway D, Jones GV. Is posttraumatic stress disorder associated with specific deficits in episodic memory? Clin Psychol Rev 2006; 26: 939-955. Guderian S, Dzieciol AM, Gadian DG, Jentschke S, Doeller CF, Burgess N. Hippocampal Volume Reduction in Humans Predicts Impaired Allocentric Spatial Memory in Virtual-Reality Navigation. J Neurosci 2015; 35: 14123-14131. Heinze G. Mente-cerebro: sus señales y su repercusión en el sistema inmunológico. Salud Mental 2001; 24: 3. Francati V, Vermetten E, Bremner J. Functional neuroimaging studies in posttraumatic stress disorder: review of current methods and findings. Depress Anxiety 2007; 24: 202-218.